Masonry had a good presence at the Henderson Heritage Day Parade on Saturday, April 26th. Demolay, Shrine, and other related Masonic groups participated. The Henderson Heritage Day Parade is always great! In the days when masons met in taverns, they would draw symbols on the floor in chalk to illustrate the lecture being given that evening. After the lecture, the Stewards or the Entered Apprentice, as a lesson in secrecy, would go get a mop and bucket and remove all trace of the drawings. 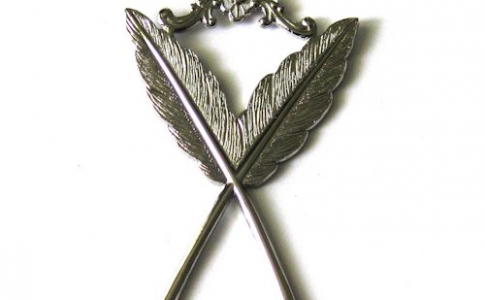 And to this day, the Entered apprentice oath has a strong focus on masonic thoughts that are written, painted, or engraved. All that sketching became tedious to do every night, so a floor cloth painted with the symbols for each particular degree was simply rolled out for the evening. Over time, the cloths were taken off the floor and hung on an easel, eventually known as a tracing board. A tracing board should not be confused with a trestle board which is a table laid flat on top of trestles or saw horses. 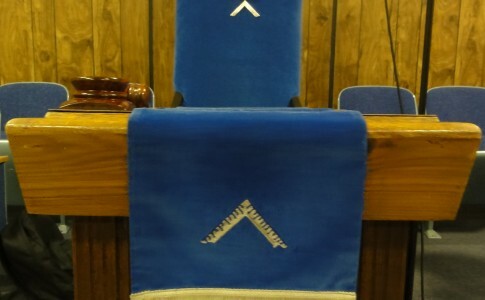 In Masonry the trestle board symbolism represents the place that builders draw their designs, for upcoming projects, and therefore in speculative masonry represents the lodge’s newsletter and calendar i.e. the work for the coming month. Without timely and proper designs on the trestle board, the workmen will fall into idleness and the craft will fall into confusion. Let’s all prevent that from happening. Hello my Brothers!! I hope all are happy and well. 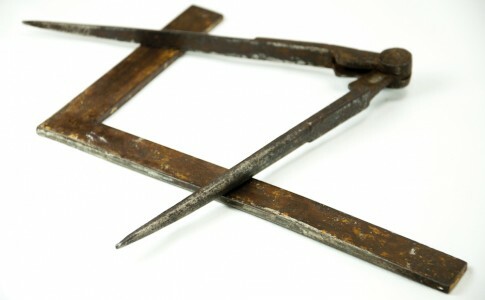 There have been several ideas that have come up recently and as a Lodge we have decided to pursue a few of them. 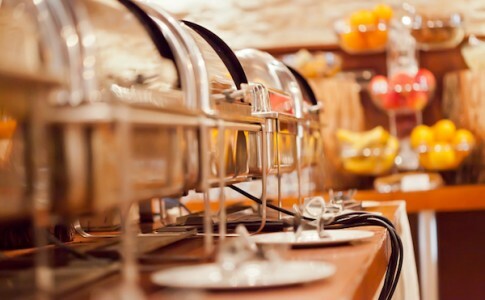 We will begin to collect non-perishable food items at Family Dinner’s. These non-perishable foods will be donated to local food pantry’s that minister to our community.We will also be starting a 50/50 drawing at our Family Dinner.Tickets will cost a dollar each or six for five dollars. One half will be used to support a worthy cause ( Scholarship fund, J.W. fund, Food Banks,etc….) while the other half will belong to the lucky winner. We will also be looking closely for our Masonic Widow’s who could benefit from our support. On Saturday May 10, 2014 at 9 A.M. I will be helping Vivian Johnson ( Bro. Harold Ray Johnson’s widow) move from her home in Sun City Anthem to an apartment near-by. With the help of a few brothers we would be done by noon. Please contact me if you are able to lend a hand. Be blessed my brothers and give thanks for all The Architect provides! May is going to be an exciting month for our lodge with the GMOV on the 7th. Please join us for dinner @ 630pm prior to the Grand Master’s message. Also, starting in June we will be serving dinner before all stated meetings @ 6:30pm. Make sure you come hungry. Finally, thank you again for all the support my family and I have received over the past several weeks. We can’t wait to show off Penelope at the GMOV. As most of you have noticed, there have been several issues with trestle-boards going out the last couple of months. From printer issues in January to computer issues in March even the month of April did not see a trestle-board. Well exciting news, everything seems to be back in order and you should be receiving it regularly again. 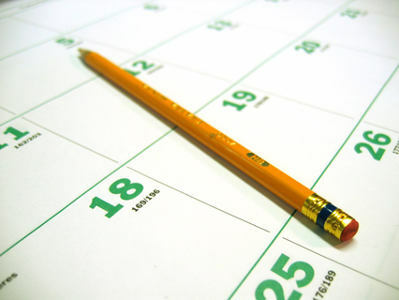 Also as a reminder if you have the ability to go online you can find our calendar of events at both our Face Book page as well as our Website. Now on to other topics, the month of May offers many opportunities to get actively involved in helping your fellow brothers. As you can see in the input from our SW we will be assisting in the move of Vivian Johnson the widow of our departed brother Harold Ray Johnson May 10th . I would also like to call upon the brethren to form a work party for the 17th of May to assist in cleaning up an overgrown yard for a brother of Mt Moriah who is currently not able.The home is located in old Henderson off Lake Mead east of Boulder Highway. We will be trimming trees, gathering debris and making a trip to the dump. Please give me a call if you can help Thank You!! Finally, there are still some brothers who have yet to pay their dues for 2014, you know who you are. Please remit your dues promptly. Worshipful Master Keir Hales delivered Masonic Education to the brethren last Wednesday on the topic of Qabbalah in Masonry. We had great attendance and the lecture was well received by all the Brothers. 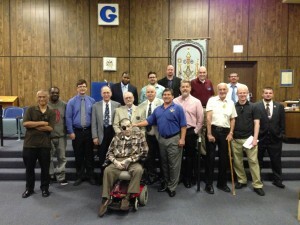 The Brothers and guests gathered for a picture after Masonic Education last Wednesday, April 23rd. Mt Moriah #39 will open at 7PM on Wednesday, April 23rd for education. 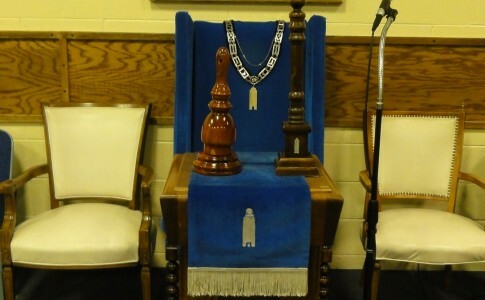 The topic will be “Kabbalah in Masonry” and the lecturer will be Worshipful Master Keir Hales. 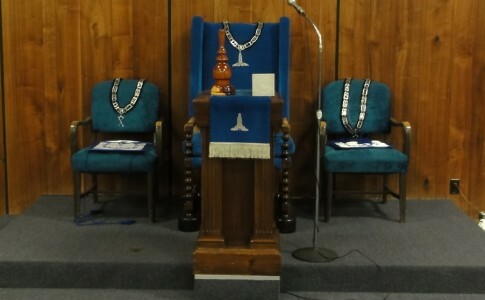 The lodge is expected to open on the first degree for the lecture. WM Hales’ previous lectures have been very well received and all Brothers are invited to attend! 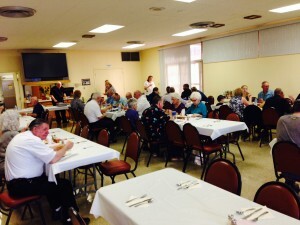 Annual Widow’s Dinner a Success! Mt Moriah #39 held its annual Widow’s Dinner on Wednesday, April 16th. The dinner was well attended and everyone enjoyed the bill of fare. For those widows unable to travel to the lodge, delivery boxes were prepared and delivered to their homes so they could participate as well. 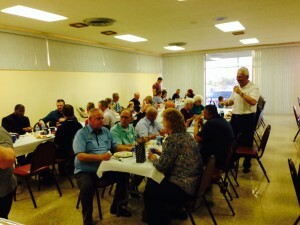 Mt Moriah #39 recognized our Masonic Widows at dinner on April 16th, 2014. The dinner was lasagna, rolls, and salad. A large dessert assortment was enjoyed by all.